What a day for the Monster Energy X-raid Team: the ninth stage, from San Miguel de Tucuman to Cordoba, did not only bring a one-two-three for the Trebur based team but at the same time, Frenchman Stéphane Peterhansel now holds a lead of nearly 50 minutes over Giniel de Villiers in second place. While buggy driver Nasser Al Attyiah, Peterhansel’s toughest rival in the battle for the lead to date, has not yet made it to the finish, so far. 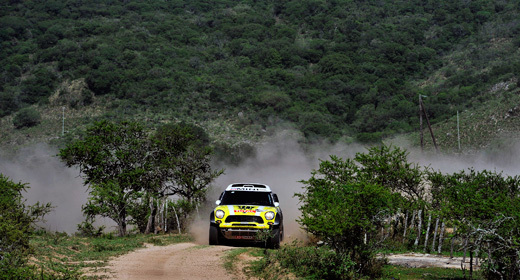 The special-stage win, however, was secured by the Spanish / French pairing Nani Roma/Michel Périn, followed by Peterhansel and his French co-driver Jean-Paul Cottret in the green MINI ALL4 Racing. Orlando Terranova (ARG) and Paulo Fiúza (POR) took their BMW X3 CC to third place, with the Russians Leonid Novitskiy and Konstantin Zhiltsov in the orange MINI ALL4 Racing completing the outstanding team result by coming seventh. In the overall ranking, X-raid also is in a very promising position: 56:03 minutes behind Dakar leader Peterhansel, Novitskiy holds third place in the overall standings, followed by Nani Roma and Orlando Terranova! Boris Garafulic holds 11th position with nine stages contested, thus also having a good chance of making it to the top 10. When the yellow MINI ALL4 Racing entered the Monster Energy X-raid Team’s service area, the fans at the fence cheered for the stage winner. “I’m truly delighted about this win – particularly for my mechanics who worked on my MINI all day, yesterday,” Roma beamed in the bivouac. And it was a very special win as his rivals gave him a really hard time. 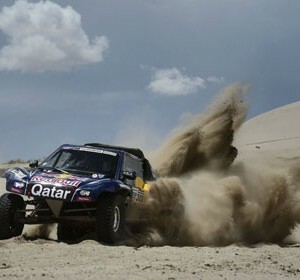 In the opening stages of the special stage, Roma had to drive in the dust of Nasser Al Attiyah fest and later, he had to cope with another dose of this treatment by Robby Gordon. 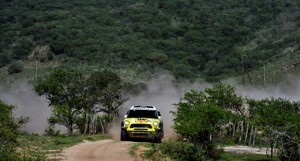 Nonetheless, he was fast enough for securing his second stage win in the 2013 Dakar Rally. Boris Garafulic (CHI) / Gilles Picard (FRA) took their MINI ALL4 Racing to 15th position, with the two Germans Stephan Schott and Holm Schmidt finishing 20th.